RIO DE JANEIRO, Feb 27 2015 (IPS) - In Brazil, one of the countries with the highest concentration of land ownership in the world, some 200,000 peasant farmers still have no plot of their own to farm – a problem that the first administration of President Dilma Rousseff did little to resolve. In its assessment of the situation in the 2011-2014 period, the Brazilian Pastoral Land Commission (CPT) found the worst progress in that period in terms of agrarian reform in the last 20 years, one of the church-based organisation’s coordinators, Isolete Wichinieski, told IPS. “There was a fall in the numbers of new rural settlements and of land titling in indigenous territories and ‘quilombos’ (communities of the descendants of African slaves), while on the other hand, investment in agribusiness and agro-industry grew,” said Wichinieski. Social movements had hoped that Rousseff, who belongs to the left-wing Workers’ Party like her predecessor Luiz Inácio Lula da Silva (2003-2011), would take up the banner of democratisation of land ownership. But her government’s economic policies have focused on incentives for agribusiness and agro-industry, mining and major infrastructure projects. According to the CPT report, during the first Rousseff administration (2011-2014), 103,746 families were granted land under the government’s agrarian reform programme. But that figure is actually misleading, because in 73 percent of the cases, the land settlement process was already in progress before the president took office, and the families had already been counted in previous years. If only the new families settled on plots of their own during Rousseff’s first administration are counted, the total shrinks to 28,000. The government reported that in 2014 it regularised the situation of just 6,289 families – a number considered insignificant by the CPT. 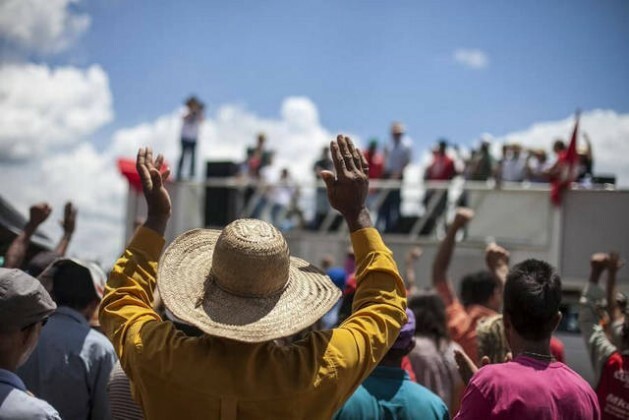 Since 1995 agrarian reform was given a new boost, with the creation of a special ministry answering directly to the president, and other legal instruments, largely due to the intense lobbying and protests throughout the country by the Landless Workers’ Movement (MST). As a result, during the presidency of Luis Henrique Cardoso (1995-2003), 540,704 families were given land, and 614,088 were settled on farms during Lula’s two terms (2003-2011), according to the National Institute for Colonisation and Agrarian Reform (INCRA), which reported that 9,128 rural settlements have been created since 2000. In order for land reform to be effective, the CPT argues, more settlements must be created and the concentration of rural property ownership must be reduced in this country of 202 million people. But the organisation does not believe Rousseff is moving in that direction, Wichinieski said. Agrarian reform was not on the agenda of the campaign that led to the president’s reelection in October, and the new government includes names from the powerful rural caucus in Congress, which represents agribusiness and agro-industry. The agriculture minister is former senator Kátia Abreu, the president of the National Confederation of Agriculture. She surprised people when she stated in a Feb. 5 interview with the newspaper Folha de São Paulo that there are no “latifundium” or large landed estates in Brazil. The conflict over land has intensified, according to the CPT, with the expansion of livestock-raising and monoculture farming of soy, sugarcane, maize and cotton, and growing speculation by large landowners with close ties to politicians. 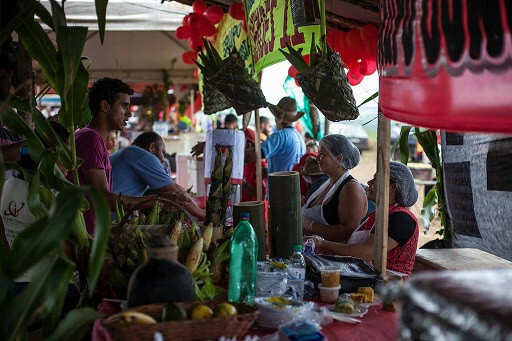 One example is the case of the 20,000-hectare Agropecuaria Santa Mônica estate, 150 km from the national capital, Brasilia, in the state of Goiás, part of which has been occupied by families belonging to the MST. The property belongs to Senator Eunício Oliveira, considered the wealthiest candidate for governor in Brazil in the last elections. In the Senate, Oliveira heads the Brazilian Democratic Movement Party, Rousseff’s main ally in Congress. He served as communications minister under Lula in 2004-2005 and last year lost the elections for governor of the state of Ceará. Valdir Misnerovicz, one of the leaders of the MST, told IPS that the estate is unproductive and that its only purpose at this time is land speculation. Strategically located between the municipalities of Alexânia, Abadiânia and Corumbá, Santa Mônica represents the largest land occupation by the MST in the last 15 years. It all started on Aug. 31, when 3,000 families marched on foot and in 1,800 vehicles to the estate, part of which they occupied. Since then, more than 2,000 men, women, children and elderly persons have been living in a camp and control 400 hectares of the estate. They are determined to win a portion of the land to farm. This is one of the MST’s strategies, said Misnerovicz. “We occupy large areas of unproductive land. In the camp we grow a variety of food like green leafy vegetables, manioc, maize, rice, beans and squash. All of the families plant healthy food in chemical-free agroecological community gardens,” he said. 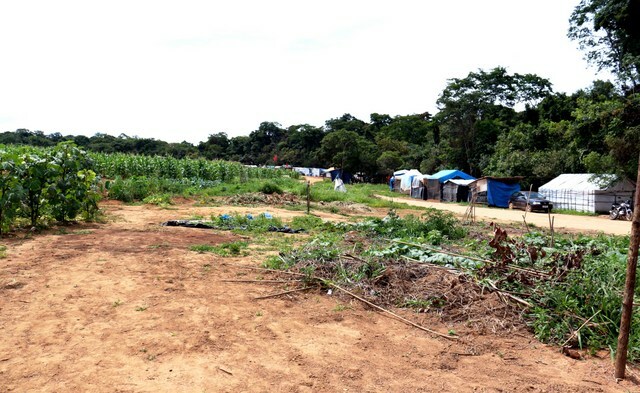 The tents in the Dom Tomás Balduíno camp were set up on the bank of a river that cuts across the estate, which comprises 90 different properties that the senator purchased over the last two decades. “The day we got there, they tried to keep us out but there were thousands of us. We are never armed. Our strength is in the number of peasants who accompany us,” said Misnerovicz. In November, a court ruled that Oliveira has the right to recover the property. But the MST leader is confident that despite the risk that the families will be evicted, they will be successful in their bid for the Santa Mônica estate to be expropriated under the land reform programme. Misnerovicz said the government itself has encouraged the families occupying the land to continue negotiating. “Then it would be possible, after a year, to make the biggest rural settlement in recent times in Brazil. We were with the president in January, who committed to a plan with targets for settling (MST) families camped around the country,” he said. The administrator of Santa Mônica, Ricardo Augusto, told IPS that the occupied area is productive agricultural property where soy, maize and beans are grown. “The purchase of the property was notarised. The MST is not telling the truth. We advocate a negotiated, peaceful solution. Productive, occupied land can’t be expropriated, and there is no interest in selling the property,” he said. But João Pedro, who was granted a plot of land in a municipality near Santa Mônica, sees things very differently. Tell gov to let everyone hav at least an acre of free fertile land to grow all their own food and hav a smal house on, its the cheapest healthiest fastest easiest way to grow food and highest yeild per acre per time and resource input if proper. Variety of food trees veganic food forest polyculture. Tell Everyone to eat plant based diet, it uses much less resources and land and is cheaper and healthier. Youtube cowspiracy. Youtube earthlings.